Day one is over. Technically it was day two, but yesterday was spent traveling from Washington, D.C., and visiting with friends in Phoenix. 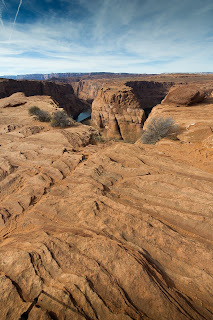 Today I traveled 350 miles making my first stop at the North Rim at Glen Canyon, but only made a few images. It was a chance to break out the gear though and also start wrapping my mind around what I wanted to capture on this trip. Everywhere you look around here the colors are spectacular, very warm, yet also subtle. For me the tendacy was to keep the 14-24mm on and just take everything in. I think I will struggle on this trip and have to force myself to use other lenes. 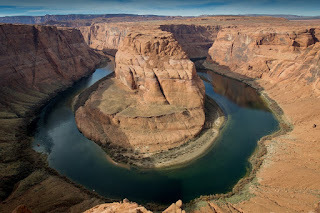 About a mile after you reach the Page city limits there is a turn off for Horseshoe Bend. The parking lot is right there and then after a three quarter mile hike, you arrive and are greeted with a really nice view. I grabbed the wide angle and inched as close to the edge as I dared. 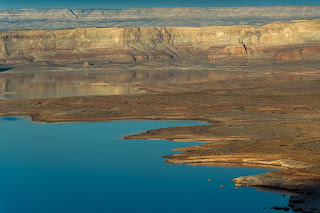 Even though it was just after noon, the sun was low enough to provide contrast in the scene, yet high enough to light all the way down to the Colorado River. I spent about 2 hours shooting and came away with a few images that I liked, even shooting a few verticals. My plan is to return tomorrow for sunrise before I have to meet my tour guide for Antelope Canyon mid morning. 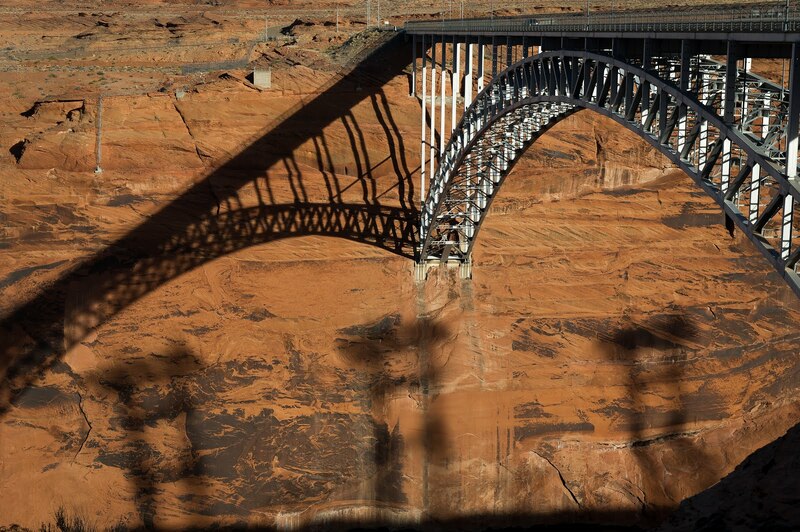 Next I continued north on route 89 and passed through Page to the Glen Canyon Dam at Lake Powell. 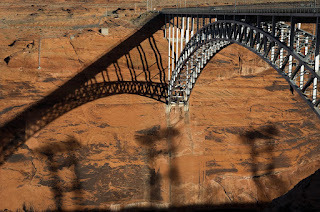 Spent a little bit of time playing with shadows created by the bridge and transformer towers. 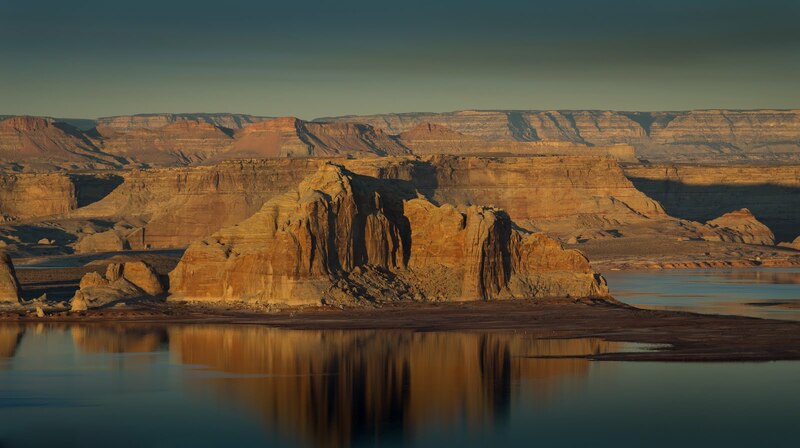 I also realized that the sun would cast some nice light on Lake Powell during sunset. The park ranger gave me some advice on a good scenic overlook and that is where I spent the final hours of the day as the sun went down. The light was very nice, but not much of a sky. And from that vantage point there are some marinas that stick out in the lake making shooting around them tricky. Normally I wouldn't mind included the boats as an element, but in this case I thought it really was a distraction. It was a decent first day. Shook out all the gear and managed to get a few images that I like and as I suspected I did meet other photographers and even received some good tips on what to look for tomorrow. Time to finish posting, get to bed early, and prepare for tomorrow. Wow... I can't even imagine what these vistas must actually look like as you're positioning yourself to take these shots. It's amazing that you can take it all in!